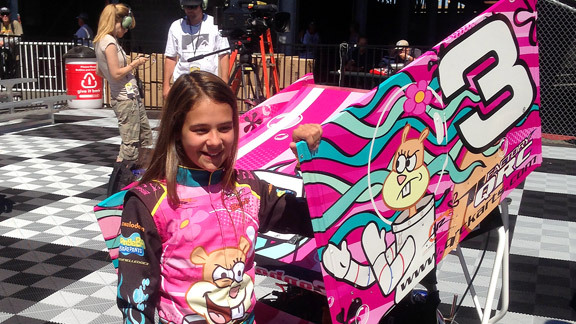 Terry Blount/ESPN Karsyn Elledge, daughter of Kelley Earnhardt Miller and granddaughter of Dale Earnhardt, shows off her Nickelodeon livery after she and her father, Jimmy Elledge, announced she is ready to start racing a Mini Outlaw Series car. SONOMA , Calif. -- Meet the newest member of the Earnhardt racing family -- 12-year-old Karsyn Elledge. Karsyn is the daughter of Kelley Earnhardt Miller, who is the daughter of Dale Earnhardt and the GM of the JR Motorsports Nationwide Series team owned by her brother, Dale Earnhardt Jr.
Jason Smith/Getty Images Jimmy Elledge is living on the West Coast now and ready to help guide his daughter's career. 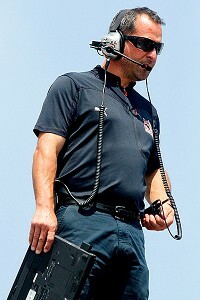 Karsyn's father is Jimmy Elledge, a long-time NASCAR crew chief who now is working on his daughter's budding career. Karsyn and her dad held a press conference Saturday morning in the Sonoma Raceway Winner's Circle, unveiling her new, bright pink Mini Outlaw Series car that is sponsored by Nickelodeon. Of course, the car sports the No. 3 made famous by her grandfather. Karsyn, who starts eighth grade in the fall, showed she already has the whole interview thing down pat. She stood on the podium in her pink firesuit with her hands on her waist, smiling from ear to ear. She was asked if she wanted to take her car out on the Sonoma road course. "Well, maybe not yet," she said. "But I hope to be out there sometime in the future." Dad Jimmy got a little choked up when talking about his daughter. He's building her cars and planning her race schedule. Jimmy now is living on the West Coast. Karsyn will spend the summer with her dad and race events in California, Montana and Oregon. "The main thing is I just want her to be safe," Jimmy said. "Right now I just want to teach her as much as I can, especially about sportsmanship." Karsyn has been racing go-karts for a few years and has won more than her share. "I've also had some races that didn't go they way I wanted," she said. All part of the learning process. Karsyn said she was nervous before Saturday's announcement, but felt better when uncle Dale Jr. sent her a tweet saying, "Good luck." Karsyn has racing heritage from her paternal grandparents, also. Terry Elledge, Jimmy's dad, built engines that Dale Sr. used to win several of his seven Cup championships. Mom Kelley raced with her little brother when they were kids. Earnhardt Sr. once said he thought Kelley had more of what it takes to be a quality racer than any of his children, but Kelley opted for the business side of things. Maybe Karsyn has some of her mom's racing talent, along with grandpa.